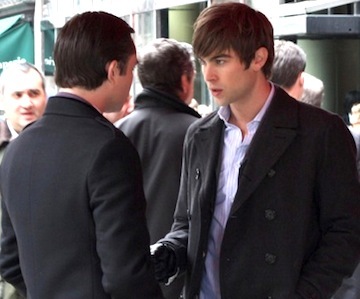 After a six season run, Gossip Girl comes to a conclusion tonight. From what I've read, the show's ending will feature a few surprises including a flashback, a flash forward and the long awaited revelation of the titular character. My love for Gossip Girl is no secret and I'm both a little sad and relieved for the end. The writing has been a little uneven for the past few seasons making it sometimes hard to watch. 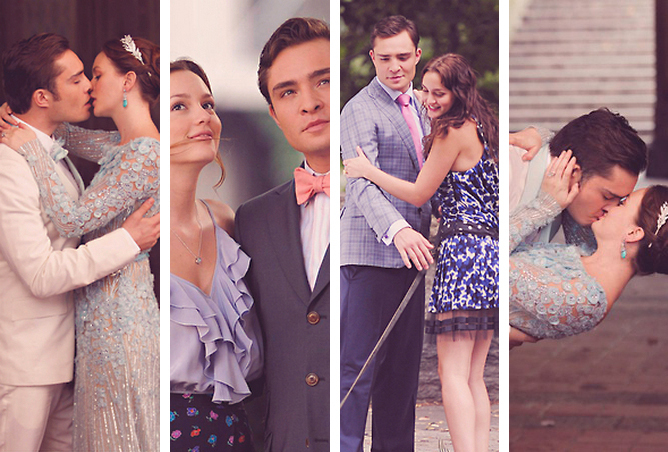 What I'd most like to see is a blissful ending for Chuck and Blair who are my favorite characters. So who else will be watching? What are you hoping to see happen? For a show that actually filmed in New York, I didn't run into in their sets much except for once during season two in 2009 and then again this past spring. Here are a few pics I was lucky enough to snap. 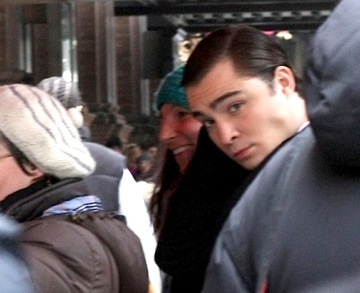 That one of Ed Westwick makes me smile. For the record, I still think he resembles T.O.P from Big Bang. I have to agree - the last couple of seasons have been a little weird, but I've been faithfully watching since the beginning. I'd like to see Chuck and Blair have a happy ending (and I predict they will). Honestly, I really liked Rufus and Lily as a couple, but I'm not so sure that's going to happen for them. I have never seen an episode from this show so I have no idea what it is about....except that the fashion was unbelievable. Well now that it is over I can get it on DVD and watch continuously without waiting for the season to stop and start. rowena, that is so cool that you got to snap these pics. hahaha, he does look like T.O.P from Big Bang! i started off watching gossip girl, but then fell behind. unfortunately, sometimes shows go on a little too long and lose that sparkle that they started off with. i hate when that happens. so i can definitely understand why this is bittersweet for you. Oh I cannot wait!!! I'm not sure if it's the season finale for us on Weds, but it's the part two bit... eeek! Hopefully there will be a happily ever after for all of them! Great pics! Have a lovely week popsy. I can't believe you actually ran into these actors while they're filming!! I would've stood there and gawked. And gawked. And gawked. I never got into this show, but was surprised all the same to hear that it was ending. Great pictures! Not surprised to hear that it is ending but I will miss it! This is such a sad occasion for all us Gossip Girl fans...what other show will we have to see with such stylish wardrobes and deviously delightful characters. We will only get the final episode about 2 weeks later than the US...a final to look forward to. 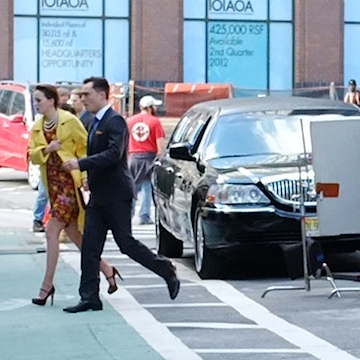 Your shots of the GG crew on set is so great, must have quite exciting! That second to last shot is a great shot! I will miss the best dressed cast on TV! I just love Gossip Girl! You were so lucky to get a few shots of your own! I have the last show recording as we speak! I love Gossip Girl. 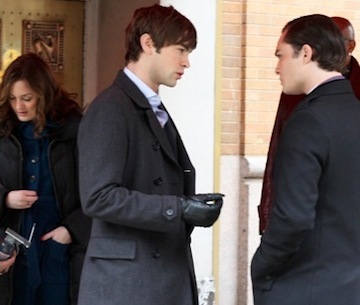 Chuck, Blair, Nate... lovely characters. These outfits are absolutely amazing. I have been watching and I almost didn't this season but then I heard it was the last so I kept it up. I'm a few weeks behind though watching it online. I like the sets a lot. I think it would be funny to run into a set like that but interesting to watch. It doesn't happen too often here. Nice photos... I don't watch the show in Spain. Have a good week, Rowena! g+ and like for you, dear friend!!! Great photos! I've actually only seen the first season so far. It's so cool that you were able to get these pics. It is pretty sad that it's over but I'm sure something fabulous will be out soon. Happy Holidays to you! Can you believe that I still have to watch season 5??!! I just don't seem to ever find the time but I really can't wait to get back into the whole Gossip girl mood! I'm so sad that it;s finishing though.. what a shame. Surprisingly, I haven't bumped into their sets at all either except for 2 times in the past also. It went by so quickly. I'm still lagging behind. Thanks for the update and photos and feel free to drop by me too when you have time. I'm really enjoying the theme/design of your weblog. Do you ever run into any web browser compatibility problems? A number of my blog readers have complained about my website not working correctly in Explorer but looks great in Chrome. Do you have any ideas to help fix this problem? I adore gossip girl! I agree that the writing is sometimes flawed but I was happy to see Chuck and Blaire end up together in the end! 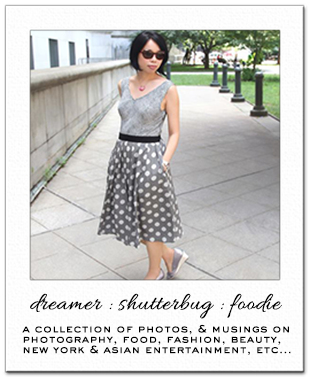 Its been so nice visiting your lovely blog, thank you! I think I zoned out of GG around season 4, I'm a little sad to see it go but am glad they are giving it an ending rather than keep dragging it out. I would love to see a happily ever after for Blair and Chuck!